There's an article in the current issue of the Southeast Examiner "Plans for Morrison Property" which cued me to write something that continues to be on my mind - planting things other than grass in our open spaces when there is a chance to do so. Here's what I wrote to the Examiner and I think the same applies to the Colwood Golf Course, and any other large open spaces we have left in Portland, Oregon and the planet. Regarding the article on the Plans for Morrison property I just have one thing to say. No more planting grass in Portland. If it were up to me, I’d make this part of the Portland Plan, as well. There are thousands of plants that grow well in our climate that need no mowing and/or weed-wacking. Since this garden is to honor a Chinese doctor - how about a huge chinese herb garden which could be used by the local chinese medicine schools. Let’s get smart in our planning and lower our maintenance and pesticide/herbicide bills by planting mosses and ferns. Also, with peak oil around the corner if not already here, every open space available should probably be put into food production – how about including a fruit and nut tree orchard in the planning? It is my sense that every vacant lot should be depaved and turned over to food production as quickly, as possible. If what happened in Cuba is any indication, urban farmers are going to be needed desperately as the oil supply decreases - why not prepare in advance for the inevitable? County Commissioner Jeff Cogen introduced a resolution (it passed) several months ago to use surplus county land for urban agriculture. Check it out. It's something I'd like apartment complexes to consider. Yes, large grassy areas are needed for the kids to play on, people to be able to walk their pets, etc. However, many complexes (especially out here in Gresham) have a lot of bushes, plants, etc. that need lots of upkeep. That's water and landscaping work that is coming out of my rent. I'd much rather them pull it all up and give residents the option of having a garden. I'd love a little space to move my herbs to, to have tomatoes, etc. Right now everything is in containers on my patio and many are outgrowing their pots. The shrubs and bushes just give stray cats and raccoons a place to hide. And the complex can cut down on its bills because they don't need landscapers to take care of the buses and shrubs (just mow the lawns) and they don't have to pay for the clippings to be hauled away - they could be composted on-site for the gardens. You might take for granted that food production happens in rural Oregon. You might be surprised. --- It's hard to eat raw wheat, seed garlic, mint oil, and hay. And that's mainly what is grown commercially here. This year with fuel prices already at $4.15/gallon here, and grocery store prices seeming about double of a year ago for those vegetables that start life in China or South America, lots of people are returning to vegetable gardening. Most rural Oregonians actually live in small towns. Where I live at the edge of Prineville was incorporated into the city last year, but other than some stawberry plants, I've never really made a garden here - until this year. I have 2.5 acres of land, most of it a hillside going up to the rimrock that marks the edge of the Crooked River valley. But I have a few level places. So I'm doing a garden this year, and so are many of my neighbors. So much so that fruit trees and seeds are selling out at the local stores. It's not easy to garden in Central Oregon. We do have 90 frost free days a year, problem is we never know when we'll have them. We've been known to have snow in July. The general advice here is to not plant until Memorial Day, but then be ready to cover up plants on any given day. Unless you live right in the center of town, and even that has no guarantee, you need a 6 foot + high fence to keep deer out. I'm a real estate Appraiser, so I see several hundred houses a year. Generally, about 1 in 20 houses has a garden, most small - until this year. My impression is that we are closer to 1 in 10 now, and they are much larger. Deer fences are going up all over the place. My garden, and this took a fair amount of work, is about 20 by 20 with a deer fence. I expect to raise enough vegetables to meet at least half of our annual needs off of that space. I have no idea how much oil/fuel will be saved - but its going to save me a lot of money after the first year. I figure the cost of the fence is an offset to the first years "profit". Besides this garden, I added the second and third apple trees to the property. I figure that from here on out, we need to be able to raise some of our own food. Being in a rural area, I know that if there are spot food shortages, the cities will be served first, and my rural area a distant second. Having food on hand, and being able to produce food, is now a permanent part of my life, and the same is true for increasing numbers of my neighbors. Portland Parks and Recreation department has community garden plots available for sign up in NE Portland and other parts of the city. It's great that there are all those places to get a plot. But you'll notice that in looking on the map, some of the areas of town that have huge populations of people living in poverty have no such place around them (there are none east of 122nd, for example). I think more needs to be done to expand the ability to grow your own food to more people. Here in Multnomah County that would mean more of them in eastern Portland (there are only about 7 east of 40th and the city of Portland's limit range in the 150th-174th area), as well as in Gresham, Fairview, Troutdale, Wood Village, and the like. A perfect place for many of those living in poverty would be at the complexes where they live. Otherwise, we should look for pieces of property that are situated near these complexes. This is exactly the kind of thinking we need to ensure a livable future. I grew up with my family having BIG gardens...summer mornings were for everyone to pick and can or freeze the ripe produce before the heat of the day set in. Labor intensive, groaned about by the kids when the cool lake water was awaiting...but ultimately very rewarding. We ate all winter off the veggies & fruit we grew. Since my parents had been rationed in England ...even many years after WWII ended, a Victory Garden was ingrained from childhood in their approach to life. My grandparents did not have a large yard in England, but Grampy always grew quite a bit on his garden plot, and would have to bring it home on the bus, on his way home from work. I remember him walking home from the bus stop with several huge stems of Brussells sprouts over his shoulders! 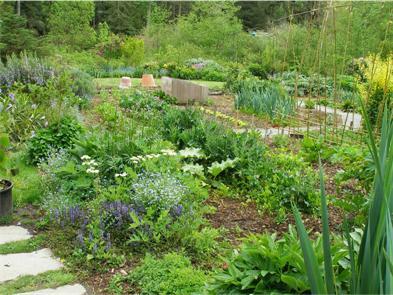 I think Portlanders would be surprised at how attractive garden plots are in the overall landscaping. They lend a richness and sense of well-being. We need to get past the archaic urban codes of the past, when the city tells apartment owners/developers, etc. just how much landscaping and sidewalk and curbing they should have. Why shouldn't apartment dwellers have a chance to grow good things and stretch their food dollars, and feel the primeval joy of hands in the dirt? Of all things man-made, nothing fits the curve of the earth so well as a garden. And whatever surplus we all produce will be sorely needed by Snowcap this year. We take loads of produce to them every summer. Pinyon pine is probably the best xeriscape crop for public space. Right across from the proposed green area on Morrison is a big, new condo building. You can bet that some of the people there will have dogs. You can also bet that some of those dogs are going to end up using that space, which is really supposed to be a memorial, as a doggy toilet. Nothing against dogs, but this seems like a poor design for the area. Using it as a space to grow food would certainly be an interesting alternative. Besides the benefits that other have mentioned above, growing some of your own food does wonders for teaching your kids to eat fruit and veggies. Between my kids' school garden at Portland's Abernethy Elementary and the garden in our backyard, my kids are eating more and more veggies and fruits every year. Something about helping plants grow gets them excited about actually eating them. I added a link to the Portland Plan in the post above. To plug another urban farming resource -- and in the interest of disclosure, my wife works there -- Growing Garden does pretty amazing work fostering organic gardening skills for local families, kids and low-income Oregonians around the Portland metro area. I agree, food not lawns. This applies to residential neighborhoods as well. Unfortunately the real estate community is big on lawns for "curb appeal". This is a shame and a waste and leads to more pollution from lawn mowers and blowers, more water waste and more dangerous chemical exposure for our children and pets. Lawns aren't necessarily a bad thing. I grew up in Texas on 4 acres, and we had a huge lawn. And besides some stuff to help keep the amount of fire ants down, we never used any chemicals on the lawn, never watered it, etc. And with the exception of really, really bad years, our grass was always green. And us kids had a place to run around and play on. I don't agree with people who say we should get rid of all lawns - kids need a place to play, people need to have a place for their dogs to go, etc. I think a mix works best - a grass covered space that is used for running on and such, and then areas of the yard that are covered in flower gardens, vegetable and fruit gardens, etc. That's how I plan on my yard being once we are able to buy a house. I would love to see Colwood become the area's newest regional park. What type of elements and amenities that a Colwood Regional Park would have is definitely open to speculation - so why not? In Oregon - away from the coast, anyway - there is not enough summer rain to keep grass green. That's not as big a problem for my unfertilized, weed-killer free lawn that stays green with moss through the winter and with clover until August. The places with lawn in my yard are either where I need to walk or where there is not enough sun to grow food. The combination of over-watering and spreading fertilizers and pesticides on lawns wastes resources and degrades our environment. Stop it. I think Mr. Kaufman is correct in assuming energy demand exceeding supply in comming years will create food shortages. Commissioner Cogen's timely resolution should be helped into material form. Urban gardens are needed now and that need will only increase. Besides the problems with food distribution with prohibitively high fossil fuel energy costs, almost anything that needs to be trucked from large centralized centers could also be in scarce supply in the near future. A friend of mine is an adobe/solar architect in NM and has pointed out recent studies to me that showing that buildings throughout the country are responsible for 60-70% of our energy waste and could be greened in many ways, including self-generation of energy as well as passive solar design. Which brings me to roof gardens which reduce solar gain and lower cooling costs. For urban food, I would add that roof gardens are a great place for food gardens. There is already a growing trend toward them, but mostly for landscaping purposes, not so much yet for food. Tony's post led me to the Keep Colwood Green website! I also saw that the Concordia newsletter has an article in the current issue about the re-zoning of Colwood. The more I think about it, the more I think it should become an urban farm - training center, orchard, food source, etc.